Although it can be tedious and boring, a well-organized stockpile can help you keep track of what you have, what you still need to purchase, and what has expired. It also makes accessing your stockpile easier in an actual disaster where you need to act quickly. Follow these tips to organize your stockpile to be even more prepared for your worst-case scenario. The first thing you’ll need to do when organizing your emergency food and water stockpile is to think about the space you have on hand. If you have an entire room dedicated to stockpiling, it may be easier to organize than if you only have a kitchen cabinet or a few shelves. When purchasing inventory, keep this in mind and don’t buy more than you can store – you’ll end up wasting it. For easy access to what you need, when you need it, organize your stockpile by the type of product. Keep your water, grains, sauces, vegetables, fruits, and any other inventory you have sorted and organized by the product type. Don’t mix and match. You’ll end up forgetting what you have, or you’ll have trouble finding what you need in an emergency. Ensure your inventory is clearly labeled and up to date. If the product has an expiration date, make sure it’s visible and can be seen from the item’s location. Keep track of the expiration dates and throw away any product that has gone past it. Make sure to keep your lists updated, and replace any product that has gone bad. Always make sure you use the proper storage and containers when organizing and storing your inventory. You’ll want to keep your food in containers that are rodent- and insect-proof, and strong enough to keep moisture and sunlight out. Ensure any storage bins and containers you use are properly labeled with the product and expiration dates. Keep the same products together even when using containers, and keep your inventory lists up to date when any product is discarded or used. 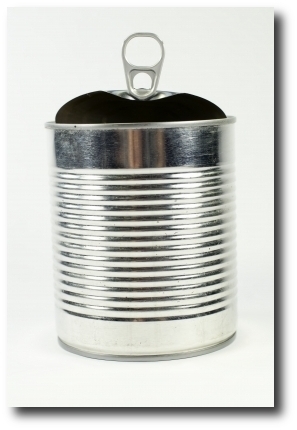 Can you guess what’s in this can? Keep your food clearly labeled with the product and expiration date. In addition to keeping your food and water stockpile in an easy-to-access location, ensure it’s kept in a cool and dark space. Keep your products away from direct contact to sunlight and moisture. If you live in an apartment or house with limited space, think creatively. You can keep your stockpile under your bed on risers, behind the couch, or even in your dishwasher. Keep food and water away from solvents, cleaners, or anything toxic. Ensure that the area you use for storage can’t flood, and keep it as clean and tidy as possible. 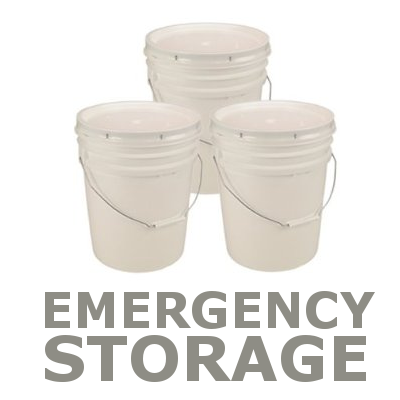 It’s important to be prepared for emergencies and natural disasters, even if your stockpile starts off small. The American Public Health Association recommends keeping at least a three-day supply of food and water on hand at any given time. Keep your supply organized from the start so you’ll know exactly what you have, what you need to get, and where it’s located. Brian Flax is a freelance writer based out of the Washington, D.C., area. He is experienced in a variety of topics including business, finance, and education technology. 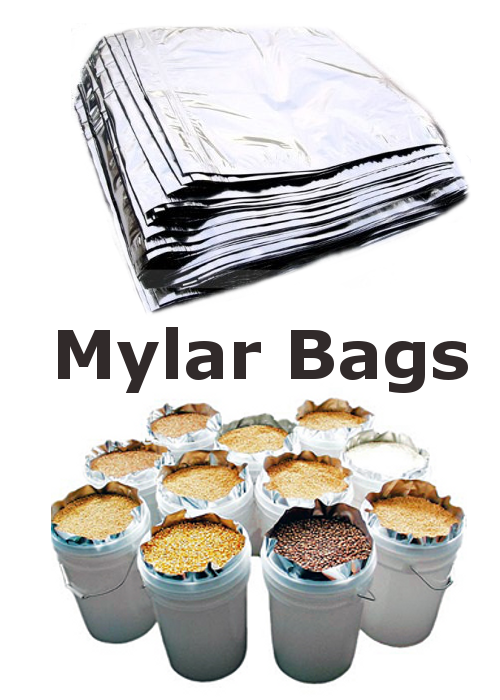 Mylar bags are metalized storage containers that create an oxygen barrier to protect food and keep it from going bad during extended long-term food storage. The bags are composed of a polyester film which is laminated to aluminum foil to keep out both oxygen and unwanted moisture. Mylar bags also come in large sizes which can storage items such as rice, beans, flour and wheat. Dividing up food into smaller mylar bags will allow you to access your food while still maintaining long-term freshness. It would be a good idea to purge the air out of the bag before sealing it. There can be insect eggs in grain and they will hatch unless you can purge all of the oxygen from the bag. Use dry nitrogen (from a 160 liter compressed gas cylinder), or even dry ice, which also works very well. For added measure adding a oxygen absorber can be included inside your sealed bag. Using mylar bags is simple. Carefully transfer the food from its larger container to the bag. Make sure to leave several inches of space at the top of the bag to allow for heat sealing. Heat sealing can be done with a straightening iron used for hair, or a standard clothes iron. Ensure that the top of the bag is free from any food as it will affect the quality of the seal. Fold over the top inch and press the iron down firmly for several seconds, and your done! Be sure to label your bags. Freezed dried or dehydraded vegetables (carrots, peppers, etc) mix in rice or beans. Flavored drink mixes (Ice tea, kool-aid, hot Chocolate mix, Tea and Coffee.